Can you believe Thanksgiving is only two weeks away? If you haven’t started your party and menu planning already, not to despair. I’ve rounded up 8 gorgeous DIYs to make your home festive! Gold Washi Tape Pumpkins - All you need is scissors, $6 washi tape & some leftover pumpkins! Post Halloween, you’ll find real & craft pumpkins on sale, everywhere. 2. Gourds - gous DIY candle votives! Flatten out the bottom and carve a small hole in the top for a mini tea light. 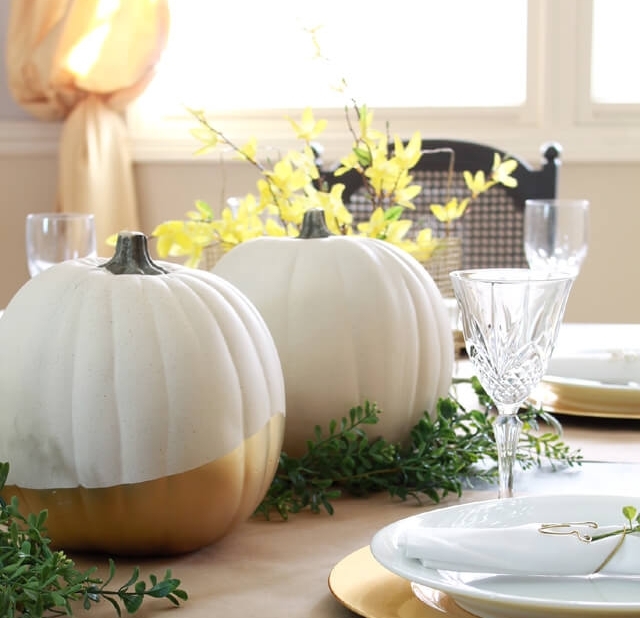 This DIY is equally gorgeous with your leftover mini pumpkins! 3. Gold “Dipped” pumpkins! This was my favorite upcycle of all my pumpkins last year! Tape off the bottom with a little masking tape, spray with gold spray paint & let dry. Simple elegance! 4. Gold Everything! Gather twigs, pinecones and all the left over pumpkins. Spray with a fine mist of gold spray paint & admire on your table or mantle. 5. 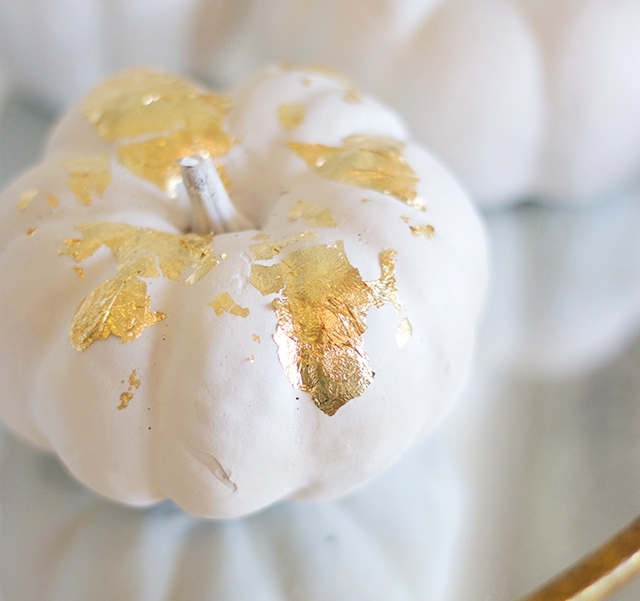 Gold Leaf pumpkins. All you need is a few sheets of gold leaf, an used paintbrush and glue! We’ve also seen the tutorial across the internet in geometric patterns! (It’s on our Pinterest Page) … Swoon! 6. The pumpkin vase! How I’ve never seen or thought of this before this week, I don’t know, but I’m in love love love with how pretty this is! You can use a craft or real pumpkins; succulents or blooms. 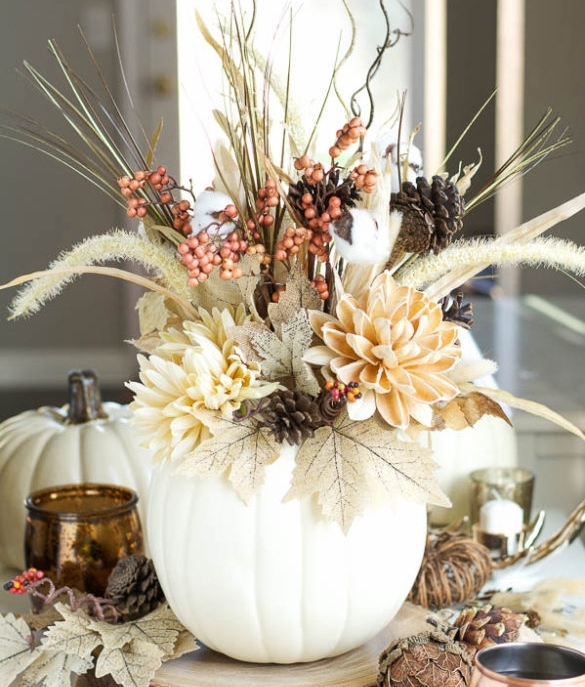 This will shine as a Thanksgiving centerpiece & there are hundreds of variations out there! Clip flowers and foliage from your yard. Need inexpensive flowers? We’ve big fans of Trader Joes! 7. Apple Votives! If you don’t have any left over pumpkins, this is a budget saver! Transform a bag of apples & tea light votives into beautiful cozy natural candle holders. Rub a little lemon juice on top to keep them from browning. 8. Gold Painted Leafs! Gather leafs in your yard or purchase some plastic sprigs from the sale section of your local craft store. You can buy an inexpensive metal ring for $2 for a gorgeous wreath! Or, sprinkle the leafs across your tables & mantles as accents. Tell us! What’s your favorite elegant budget friendly Thanksgiving DIY? Need more elegant DIYs to fit your budget? Head over to our Pinterest Page.